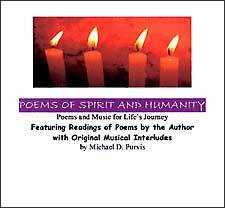 Like the Within recording, Poems of Spirit and Humanity is perfect enrichment material for a special prayer time or bible study. Its recurrent theme of the soul searching for God and Spirit will strike a familiar chord in all those who are seekers after God and His love. listeners will enjoy Michael's clear, expressive voice reading wonderful, human and spirit themed poems, plus beautiful musical interludes. readers will likewise enjoy these meaningful, uplifting poems and a large, forty page color art print section, entitled "Artwork of Spirit and Humanity." How completely it comes home!" that we are not at ease with our journey. "'Life ain't no crystal stair', son." All with wisdom for God's children. (time being an illusion, I suspect more and more). It is bend or break. we must heal, take time to become green again inside. baskets which are both gift and giver. 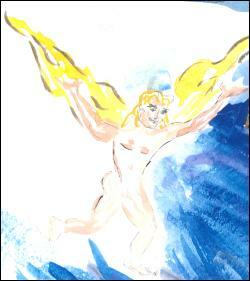 "Poems of Spirit & Humanity"